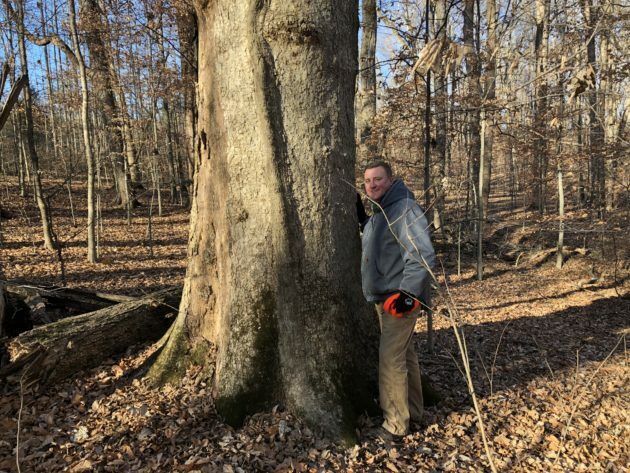 A stand of towering old-growth trees in Owen County will soon be protected forever by Sycamore Land Trust. Hoot Woods, which has been in the Hoot family since they emigrated from Germany in 1860, is home to an old-growth beech-maple climax forest. The family is donating 80 acres from their original 160-acre homestead to Sycamore Land Trust. The deal will be complete by the end of 2017. The Hoot family reached out to Sycamore to discuss the significant donation, which will be the organization’s first old-growth forest, and will put the land in permanent protection. Read the story in The Herald-Times. (If you’re not a subscriber, here’s a PDF). Sycamore never logs any land that we own, so these 200-year-old trees will be protected forever. These woods include at least 22 species of trees. The largest tree on this site is a chinquapin oak (pictured above), now dead, which still stands at 48 inches dbh (diameter at breast height). To help Sycamore protect these woods and other important natural areas, donate online. Thank you! Protecting old-growth forests is critical to preserving Hoosier heritage and creating the world we want our descendants to live in. Indiana was once covered in 20 million acres of forest; today, approximately 2,000 acres of those woods remain. This is what we call old-growth forest. Climate change will challenge much of our previous understanding of old-growth forests, along with all of our natural ecosystems. We continue to study these systems and seek greater understanding of how they work. One thing we do know — nothing remains the same. How systems adapt to change is a world of study. Places like Hoot Woods provide a tremendous opportunity to learn. Benefits of forests like this are numerous, and we are continually discovering more about the complex ecosystems that form around undisturbed woods. Due to the sensitive nature of this forest, especially the fact that it is filled with beech trees which vandals love to carve their initials into, we currently have no plans to build a trail and open it to frequent public use. However, we will schedule some hiking events for Sycamore members to bring people to these beautiful woods so they can experience the grandeur of these trees for themselves. To become a member, visit sycamorelandtrust.org/donate. Members of the media: For photos, quotes, and more information, please contact Abby Henkel, Communications Director, at abby@sycamorelandtrust.org or 812-336-5382 ext. 101.